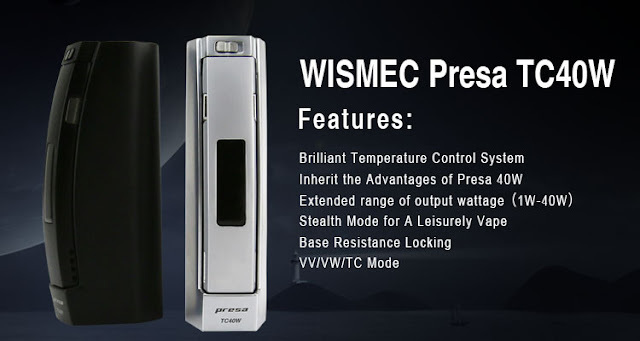 Yes, another Wismec Presa version, Presa TC40W. Very stronger, you must be interested in it, follow me to know it! 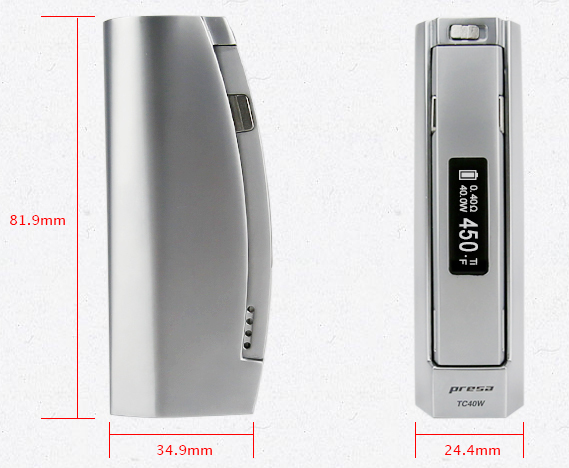 Presa TC40W creatively adopts the brilliant temperature control system providing a healthy and low-loss vaping experience for vapers. Impressive vapor without dry hits can be produced under TC-Ti/TC-Ni mode while the consumption of electricity and liquid is reduced substantially. Meanwhile, you can find all the advantages from Presa 40w being inherited by TC40W. Traditional watts control(1W-40W) is also available. The WISMEC Presa TC40W does a good job preventing dry hits while in temperature control mode and using Ni200 (Nickel) or Ti (Titanium) coils in RDA's, RBA's and various subohm tanks. The consumption of electricity and e liquid is dramatically reduced compared to the original Presa. If for some reason you don't want to bother with nickel or titanium coils, The Presa TC40W also offers traditional wattage control (1W-40W) with Kanthal wire coils. 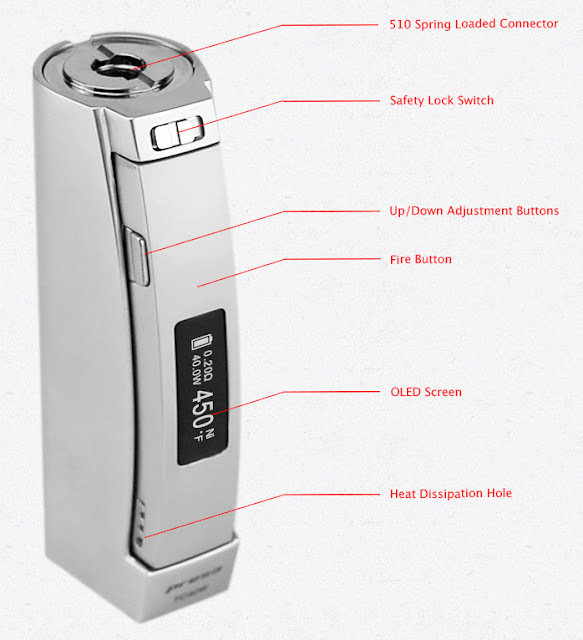 Remarkably unique and packed with the markets latest features, the Wismec Presa TC 40W is an outstanding device all around. The Presa TC 40W is the second addition to the Presa line-up, this time featuring the industry's latest temperature control feature, which will allow you to use the Presa with both Nickel 200 and Titanium coils, eliminating dry hits and reducing e-liquid consumption. Furthermore, the Presa features a range from 1W to 40W, giving you the ability to take advantage of most temperature control coils available on the market. 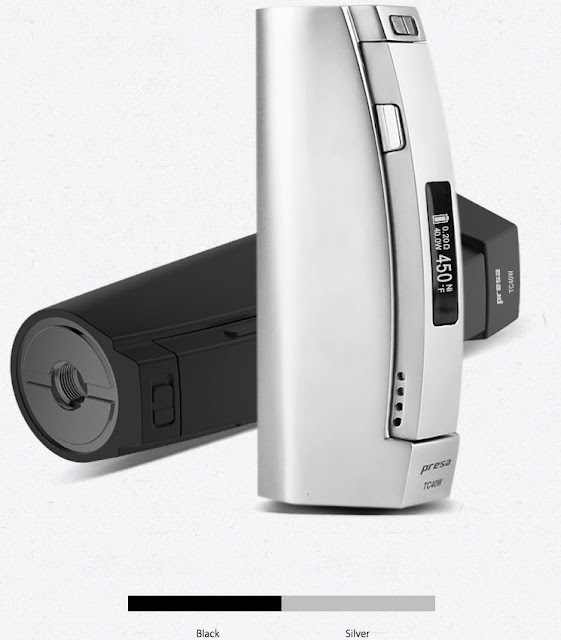 Moreover, you'll be pleased with its unique firing button and adjustment buttons, 2300mAh built-In battery capacity, as well as its brightly lit OLED screen and 510 spring-loaded connection, which makes the Presa highly compatible with most atomizers available. Other features include base resistance locking, safety locking switch and a new stealth mode feature. 1. Brilliant Temperature Control System: Providing a well control for the working temperature of coil, TC modes could help you enjoy a better vape taste. No more dry hits and the consumption of battery power/liquid will also reduced obviously. 2. Stealth Mode for A Leisurely Vape: One can enjoy vaping with the screen off, attentively experiencing a different vape that Presa TC40W brings. 3. 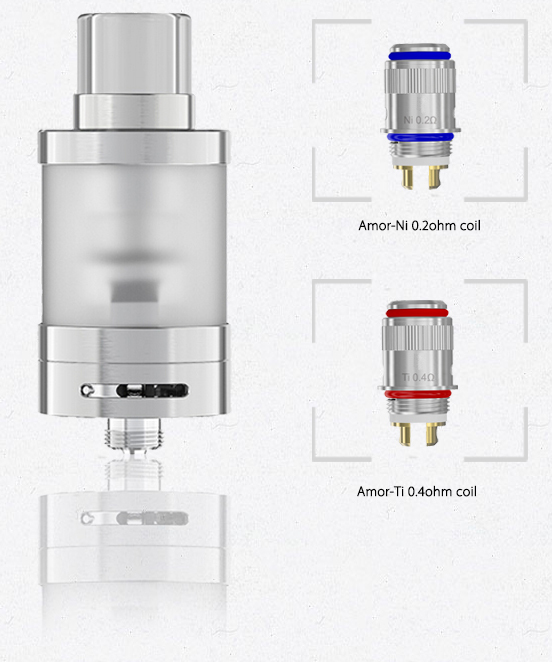 Base Resistance Locking: Presa TC40W could lock the base resistance of atomizer so as to make sure the device is always working under correct parameters even if you remove the coil during using. 4. 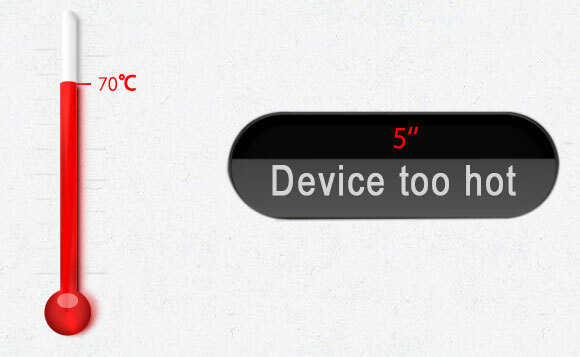 Temperature Alarm: Once the temperature of the device is over 70℃, the output will shut off automatically and the screen will display "Device too hot" for 5 seconds. During this time, the battery will cool, which is safer for users. Note: Only use Wall Chargers/adapters that have an input of 100-240 V 50HZ-60HZ and an Output of 5V/500 mah. Warning: Do not attempt to modify equipment. Please refer to your manual for further safety instructions. If you like it, Order now, best price at here, don't miss it! 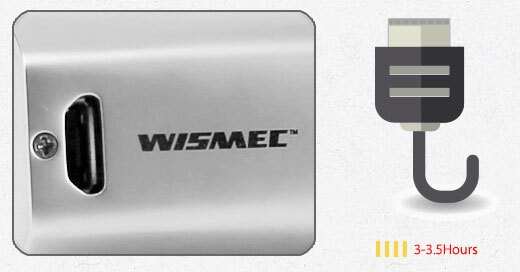 Wismec.org is Wismec Official authorized online store, you can enjoy perfect after-sales service.